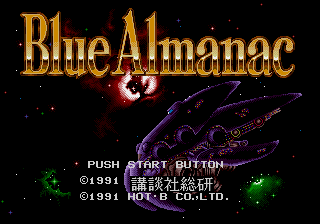 Blue Almanac (ブルーアルマナック) is a 1991 RPG for the Sega Mega Drive by HOT-B and the first Mega Drive game published by Kodansha Research Institute. While it was only released in Japan, a western release of the game, now retitled as Star Odyssey, was planned by Sage's Creation for release in July 1991, but the translation was cancelled for unknown reasons. A version of Star Odyssey was reviewed by GamePro in its June 1992 issue, complete with a MSRP of $69.99, suggesting the game was close to a US release. Two prototypes were independently discovered by drx and by Brandon Cobb, head of Super Fighter Team, who subsequently acquired a license to complete the translation from HOT-B successor company Starfish (who like to revisit old properties), with intentions on releasing it on the twentieth anniversary of the original release. Despite his PR claiming that he received an "unofficial license" from Sega to distribute the game, Sega really asked him to remove their copyrights and trademarks, consequently making the translation fully unlicensed (while Blue Almanac is fully licensed). Main article: Blue Almanac/Magazine articles. 1MB 1992-01-16 CD-R disc Localised US version. ROM header says 1991-10. 2MB 2011 Cartridge (World) Super Fighter Team version.